Copeland Sole Executor in the Same Will named. in New England. To all unto whom these presents Shall come Greeting. Executor in his s^d Will named. Well and faithfully to administer the same. whereof I have hereunto set my hand and the Seal of the s^d Court of Probate. Dated at Boston afores^d the day and yeare first above written. chest, one platter of Pewter, one warming pan, twenty pound of good Flax. in presence of Joseph Arnold, Jonathan Hayward, Joseph Allen. appears he will cause it to bne added. 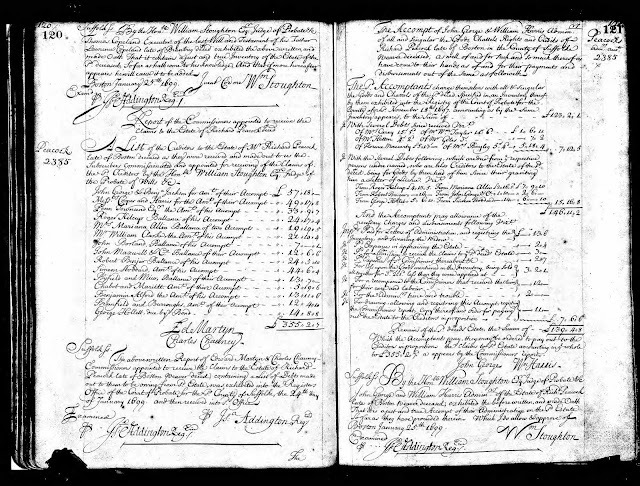 Massachusetts, Wills and Probate Records, 1635-1991, indexed database with digital images, Ancestry.com (http://www.ancestry.com), Suffolk County > Probate Records, Vol. 13-14, 1688-1701, Volume 14, pages 118-`120 (images 454-455 of 652), Lawrence Copeland probate records, 1699. 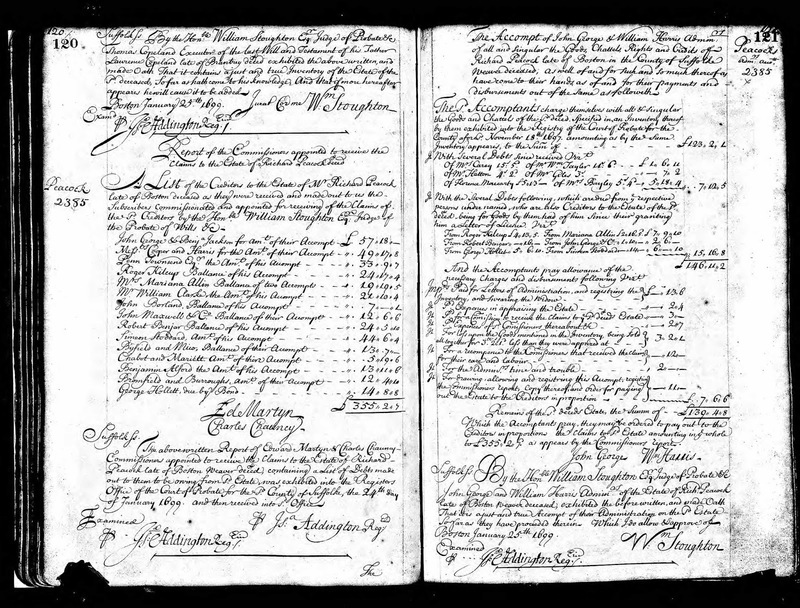 Lawrence Copeland and his wife, Lydia Townsend (1630-1688), had 9 children, of which 7 lived to adulthood. The will names the seven as heirs - Thomas, William, John, Lydia, Ephraim (deceased), Hannah and Abigail. 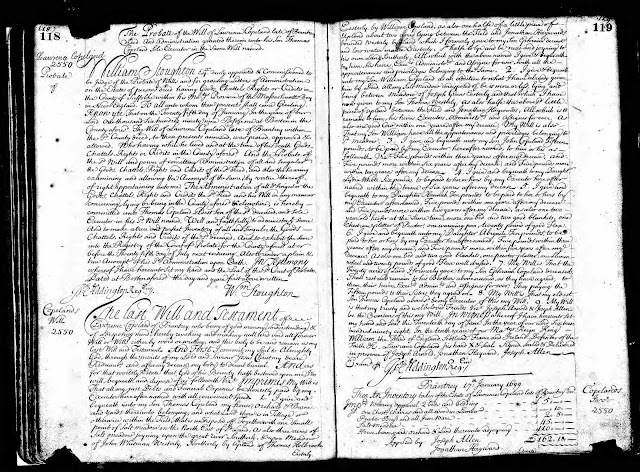 Of the daughters, only Lydia (1661-1727) was married at the time of the writing of the will - she to Joseph White (1662-1757) in about 1681; they resided in Mendon in Massachusetts. Lawrence and Lydia (Townsend) Copeland are my 9th great-grandparents. I am descended through their daughter, Lydia (Copeland) White. Hello 10th cousin - Lawrence Copeland is my 9th great grandfather, too. In fact, my mother was a Copeland, though the name daughtered out with my mother's generation. I descend from Lawrence's son John and wife Ruth Newcomb.